Grain sorghum is the main summer cereal crop grown in northern NSW. It is mainly used as stock feed in the cattle, pig and poultry industries. Sorghum stubble can also be utilised after harvest as stock fodder. Maize is the other main summer growing cereal. Rice is a summer grain sown mostly in the Murrumbidgee and Murray Valleys of NSW. The rice industry is recognised as a producer of high quality rice with attributes that satisfy diverse markets. 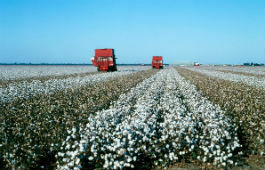 The cotton industry in NSW has a reputation for producing high quality fibre sought by buyers in Indonesia, China, Korea and Japan. DPI scientists work closely with growers, collaborate with scientists in CSIRO, Cotton CRC and the universities and conduct research on cotton production factors such as irrigation, fertiliser, soil, crop physiology and insect, weed and disease management. Helpful tips, benefits of pre-emergent herbicides and trial results.